It is, therefore, the study—or the ART—of knowing how you make those decisions, so you can create the results you want. In fact, Meta Dynamics™ will even provide you with the SPECIFIC steps, or blueprint, to help you get there. Developed by Sharon Pearson utilising over a decade of experience as a highly successful and influential coach, leader, trainer, mentor and business owner—and previously only available to private clients—Meta Dynamics™ revolutionises the next level of personal and professional evolution. It is the most innovative breakthrough in human behaviour, and neuroplasticity, since NLP, based on the original work of Richard Bandler and John Grinder. Meta Dynamics™ takes a giant leap forward… It is the next stage of evolution in NLP and coaching, and is proven to get you RESULTS—faster than you’ve ever experienced them. How Is Meta Dynamics™ Different To Traditional Coaching? You may already know this… Traditional coaching focuses on the actions your client takes, and places emphasis on creating the mindset necessary for achieving sustainable change. It’s a model that works well on the surface, however, to truly flourish and to create lasting change, it is vital to go deeper and understand your perceptions of the world, because they play a FAR more important role than simple observations of an event. Meta Dynamics™, however, takes a giant leap forward from the traditional ‘event’ focused coaching session and looks instead at your perceptions, so that you have the best opportunity for influencing your response, and therefore your results. This approach allows you to create—and sustain—a more complete path to transformation for you, and your clients. What if you were to look at life like this? Everything you see, hear or experience is specific to you, and influences how you experience an event. Another way to look at it is that you don’t experience the world the way it is, you experience the world based on who you are. When you grasp the idea that you create a universe by perceiving it, you instantly recognise that everything in the universe—and every event — you perceive is specific to YOU. Meta Dynamics™ is The Frame - it's a game-changer because it is a model of how the brain works to organise everything that goes in, in order to strive for the best outcomes that it knows how. That's the reality that we experience. If you find yourself repetitively "wishing you could...", "resenting X because...", "getting annoyed...", "getting saddened...", "feeling tired from the challenge that things keep going against you..." or just wish you could "find greater happiness", "find greater excitement", "be this", "be that", "find that shot of motivation so you can start 'doing' and not distracting yourself (killing time)", then you, secretly perhaps, want to learn how to use Meta Dynamics™. 1. Because of this change in you, the event is experienced differently. 3. Because your response is different, the result changes. What Levels Of Perception Are There? Or whether they are away or avoid people? Once you know this you can tailor a step-by-step blueprint that will help your clients clearly shape their perceptions and, therefore, shape their responses—leading to swift transformation. At the same time as helping your clients in a profoundly deep way, it’s easy to imagine that you will developed a new-found confidence as a coach because you now have an artful tool at your disposal that gets your clients results—and they will love you for it. Created using four dimensions of human behaviour, the Meta Dynamics™ Critical Alignment Model will give you an easy to follow, step-by-step map for identifying where you are right now, how you can improve, and ways to naturally develop yourself—instantly. So what are the four dimensions of the Meta Dynamics™ Critical Alignment Model? ENVIRONMENT The first level in the Meta Dynamics™ Critical Alignment Model is about the OUTCOME you want to achieve. ‘Environment’ connects to your thinking style and how it relates to creating an environment that is useful for motivating and inspiring your reality as well as overcoming personal obstacles. STRUCTURE The second level in the Meta Dynamics™ Critical Alignment Model is about what you need to ACHIEVE the outcome. ‘Structure’ connects to your thinking style and how it relates to designing a strategy and plan that helps you achieve the results you desire—and your ability to anticipate and solve any challenges along the way. Structure is the benchmark of what YOUR success looks like. IMPLEMENTATION The third level in the Meta Dynamics™ Critical Alignment Model will show you how to apply the ACTIONS you need to take to achieve your desired outcome, and how this compares to your ideal benchmark. 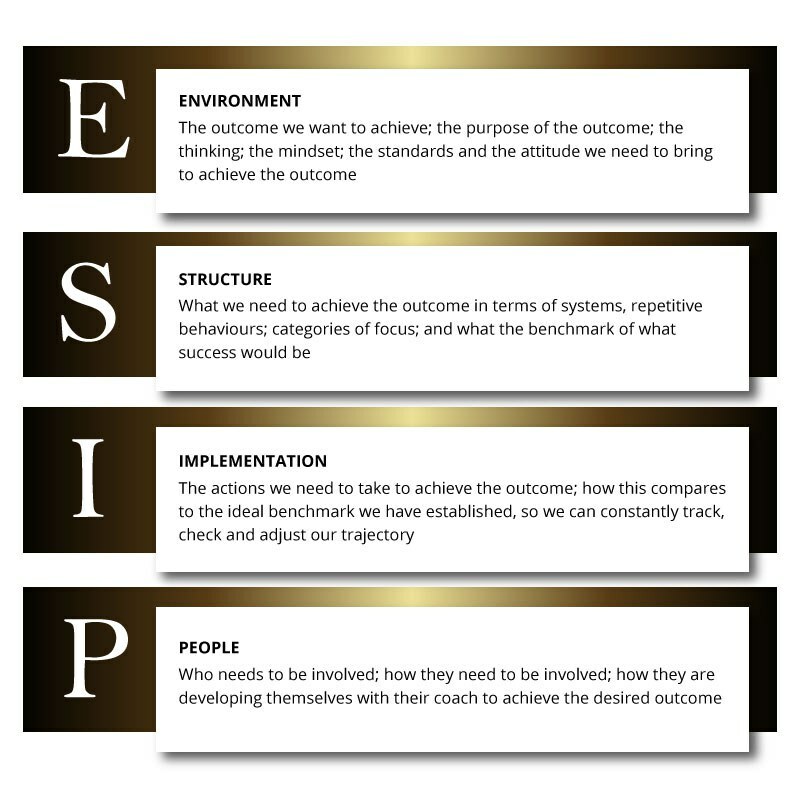 ‘Implementation’ connects to your thinking style and how it relates to delivering results, and your ability to stay focused on your goals with a strong sense of purpose and accountability. By knowing about your implementation level you can easily track, review and fine-tune your progress. PEOPLE The fourth level in the Meta Dynamics™ Critical Alignment Model takes into consideration WHO needs to be involved, how they will be involved, and how they are evolving to achieve the desired outcome. ‘People’ connects to your thinking style and how you develop relationships and realise the potential in the people around you. Meta Dynamics™ goes one step further by helping your clients get in touch with the six levels of perception that occur before an event, putting emphasis on deeply establishing—and sustaining—a clear mindset, and flow, essential for success. Dream Team is the award-winning marketing and innovations hub for The Coaching Institute and the coaching industry. Whether it's testing new ideas or challenging the old, updating best practices or disrupting conventions, Dream is here for you with the latest and best in the coaching industry along with tools, tips, strategies and case studies of real-world results that are breaking industry records. TCI’s First Ever Foundations of Coaching Success in Auckland! "We Rise by Helping Others"